Use Zapier to connect Disqus to over 1,000 other apps. Zapier is a workflow automation tool that helps you managing new comments and taking action on autopilot. The Disqus-Zapier integration allows you to send Disqus data to hundreds of other apps. To see a few examples, check out our integrations page with Zapier. For example, you can send New Comments in Disqus to a Slack channel to alert your team, automatically send an email, or even trigger an SMS message. Visit How To Use Slack To Supercharge Your Disqus Moderation to learn more. 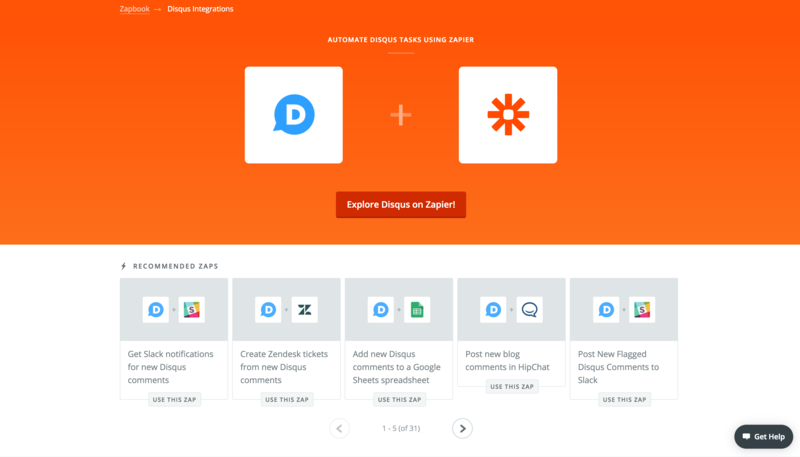 You'll connect Zapier to Disqus while setting up your first Zap. "Zaps" (which are Zapier’s name for app workflows) can be created quickly and easily. Use them to send information from Disqus to other other apps like Slack , Zendesk, Mailchimp, Gmail , and Facebook Pages automatically. First, you'll need a Zapier account. Sign up for a free Zapier account if you don't already have one. You can also create custom Zaps by visiting the Zapier-Disqus Integration Page and choosing Make A Zap. When selecting a Forum in the Trigger step, you can enter a Custom value if your site’s shortname does not appear when selecting from the dropdown menu. The Forum should be the site where Disqus is installed. In order to use the New Email Subscriber trigger, you will need to have a Disqus Pro subscription. If you would like to subscribe to Pro, you can do so in your subscription settings at Admin Settings > Subscription and Billing. Zapier offers a free plan that you can use to set up 5 Zaps and run 100 tasks per month. Zaps on the free plan run automatically every 15 minutes and is only counted as a task if it was triggered successfully (e.g. a new email subscriber was found). More info on paid plans can be found on their Pricing page.